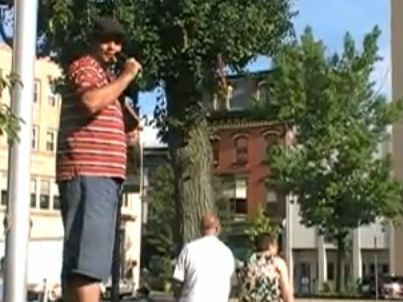 On July 10th, Gregory Jacobs was arrested while preaching the Gospel at Easton, PA’s Heritage Day festival. Police Chief Larry Palmer supports the actions of his officers and affirms the issue arose out of people being offended as he said “several children and adults who were in attendance were in fact offended at him yelling at them telling the children that their parents and they were going to hell and such.” Chief Palmer said it was the use of amplification which interfered with a city event that was intolerable. He would not comment on why the officer said Greg would be arrested if he offended anyone else, rather than saying he would be arrested if he used amplification again. The president of Heritage day, Nancy Post, apologized for a slow response when asked about this situation citing her job as cause for the delay. In reviewing the mayor’s emails, it seems Nancy took time to get input from the mayor and several others before responding. Nancy ended up issuing a statement, but never addressed the direct question of whether or not her or any representative of the festival called the police on Gregory Jacobs for preaching at the festival. Leonard Buscemi of the Greater Lehigh Valley Chamber of Commerce served as the treasurer of Heritage Day. In an email, he advised Nancy that if she were to make a comment to this author, it should be very ambigious and recommended she not comment at all. Easton Heritage Day Inc. is a non-profit PA 501c3 organization that celebrates the historical heritage of the City of Easton by sponsoring the Easton Heritage Day Festival. Our volunteer members and officers support and celebrate the Constitution of the United States and the Declaration of Independence. We provide a family oriented event annually that promotes activities that are relative to our heritage and comply with all rules and regulations of the City of Easton. We respect all visitors’ rights and ask that all of our volunteers, participants and entertainers also do so. Each participant within the festival area must be either invited or contracted by the festival committee, to ensure that compliance of the festival guidelines and mission be adhered to. Any individual or group not authorized by the festival committee prior to the event, will be deemed non-compliant with festival guidelines and asked to be removed to outside the festival area. At no time did this gentleman or the group he represents request permission to take part in the event and complaints about his demonstration were received by festival committee members from visitors to the evening’s events in the Circle. I believe we obviously uphold and support the Constitution and Declaration and celebrate our freedoms, but we also respect the rights of all participants and spectators and would not condone or allow any offensive behavior. We also support the local municipal laws and their enforcement and believe the Easton police gave the gentleman every opportunity to continue his freedom outside the festival area, which was part of the sanctioned event by the City, and after his refusal to obey the request of the officer followed appropriate measures. The reoccurring charge we see from the president of Heritage Day, the Mayor, the arresting officer and the Police Chief is that Greg’s message is offensive. The apostle Paul concurs. “For the message of the cross is foolishness to those who are perishing” (1 Corinthians 1:18a NIV). Preaching an offensive message may have gotten Greg arrested, but it isn’t the charge he will be defending in court. Greg will have his day in court on Wednesday, September 1st where he will be defending himself against the charges of noise disturbance and disorderly conduct. Greg is represented by David Dye. In an interview with Witnesses Unto Me, Mr. Dye was hesitant to comment on specifics since his defendant had pending criminal charges against him. Mr. Dye did state that no city ordinance could be made that would nullify his clients first amendment rights. Greg stated that his attorney is working pro bono, suggesting his attorney may recuperate costs through a civil case. Greg indicated that he was not interested in taking money from the city, but both he and his attorney were uncertain if they would pursue civil action against the city.